Available in cherrywood, walnut, and many other types of wood on request. 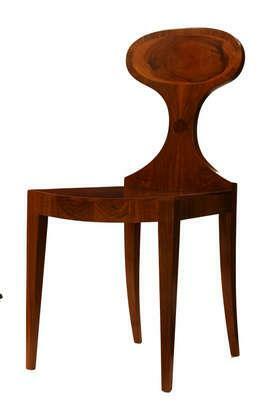 Blossom-back chair in Viennese Biedermeier style, with tapered front legs, with straigth side frame elements, back legs curved in one dimension, glue-laminated blossom-shaped curved back dowelled into the back legs and veneered on both sides, with ornamental grooves, with lavishly veneered and bended wood as seat. Handcrafted.